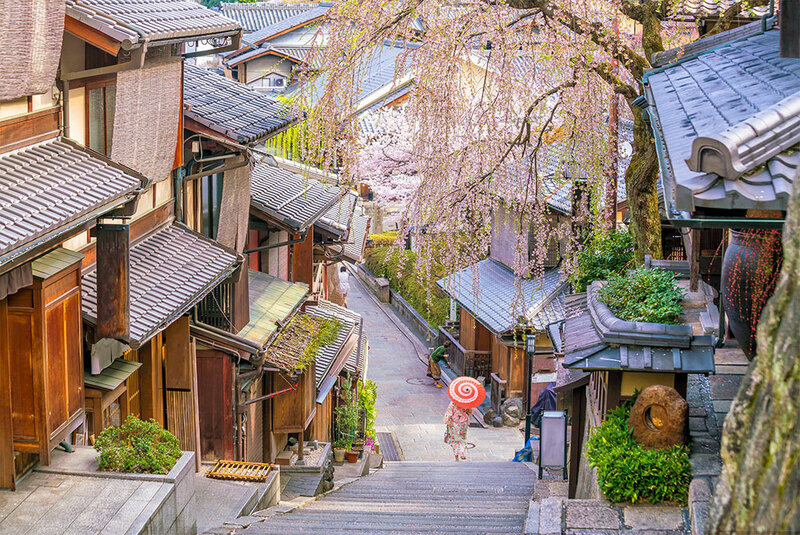 When you think of Japan, there are certain things that spring to mind: delicious food, kind people, trees filled with cherry blossoms, historic temples, and incredible natural landscapes. But did you know that Japan also has a plethora of impressive hot springs for you to indulge in? Japan boasts some of the world’s most beautiful hot springs, each offering a wonderfully relaxing and memorable experience for travelers. In fact, it is estimated that Japan has more than 26,000 hot springs and over 3000 hot spring resorts! With so many to choose from, it can be difficult to know know what exactly to expect. Not to worry – just read our comprehensive guide to discover absolutely everything you need to know about Japanese hot springs. Hot springs, or ‘onsen’ in Japanese, have always held an important place throughout Japan’s history. The first recorded hot spring in Japan, Dogo onsen in Ehime Prefecture, dates back to the year 712. The initial discovery of many of Japan’s hot springs is thanks to ancient hunters, who came across them on their hunting trips. Given their magnificent beauty and uniqueness, hot springs were historically considered to be a gift of the gods. Their popularity boomed when when Buddhism was brought to Japan in 552 AD, due to the Buddhist belief that bathing was a form of purification and cleansing. While there were attempts by Christian missionaries in around the 1550’s to scale back bathing in hot springs, as they saw it as an offensive practice, their efforts were futile as Japan’s love of onsen was already deeply entrenched in the culture. In 1709, the healing properties of hot springs were discovered, which lead to the eventual commercialization of hot springs. Today, going to the hot springs remain a beloved activity for Japanese people, who recognize the benefits of health, relaxation, and enjoyment that only a dip in a hot spring offers. Known as the hot spring capital of Japan, Beppu, Oita Prefecture, is a quaint city well-worth adding to your Japan itinerary. 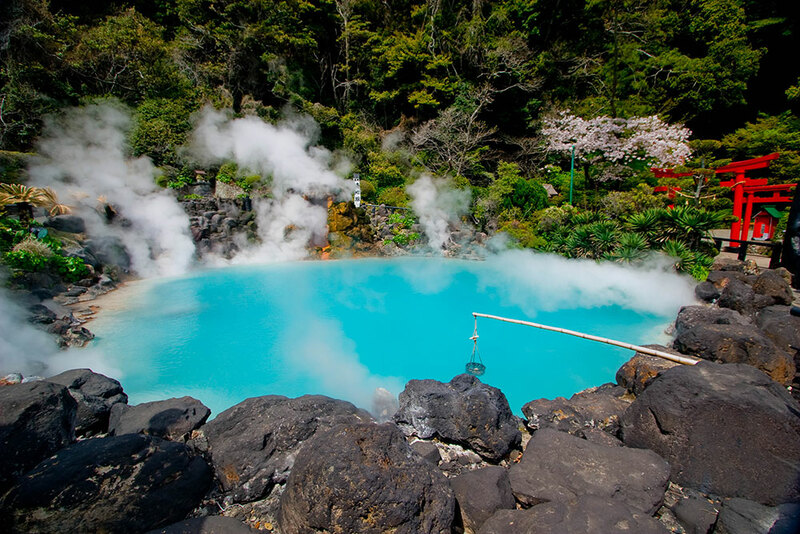 Divided into eight hot spring areas, Beppu’s hot springs are well-regarded for their richness of resources. Nearly 3000 hot spring vents are located in the city – representing greater than 10% of Japan’s total. An incredible 130,000 plus tons of hot spring water flows from the ground every day! 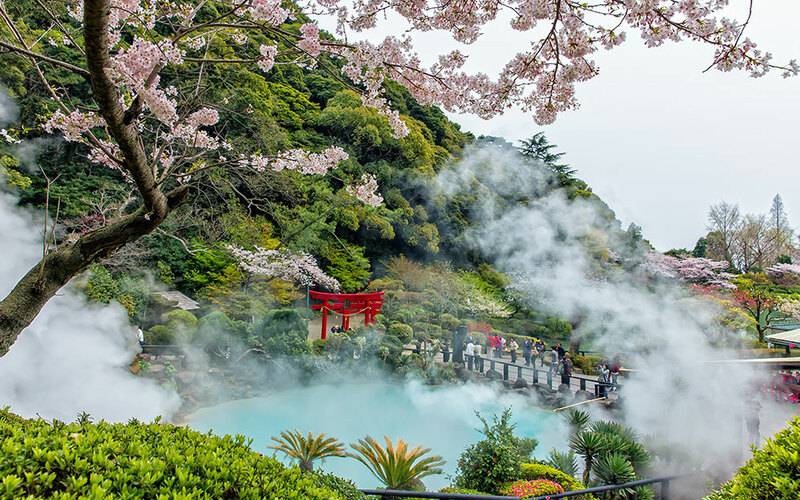 Must visit hot springs include Takegawara, Beppu’s oldest hot spring, the low-key but popular Hyotan Hot Spring, and the unbelievable Hells of Beppu – which are one-of-a-kind hot springs for viewing rather than bathing. How to get there: There are frequent flights from Tokyo, which take only 90 minutes. Alternatively, take the 6 hour train on the Tokaido/Sanyo Shinkansen from Tokyo to Kokura Station, and transfer to the Sonic limited express to Beppu. You can also take a 40 minute bus from Oita Airport to get to Beppu. For centuries, Hakone, Kanagawa Prefecture, has been one of Japan’s most popular hot spring resort towns. With more than a dozen springs providing hot spring water to the countless hot springs in the region, you’ll find no shortage of unique hot springs to test out. The most famous of all are the hot springs located in Yumoto, an area known for its rich history and high-quality water. Other places you can experience a second-to-none hot springs experience include: the luxury ryokan (a type of traditional Japanese inn) Gora Kadan, the Hoshino Resort Kai Hakone located by the Sukumo River, and the Fujiya Hotel, which was founded back in 1878 and is one of Japan’s oldest hotels. How to get there: Hakone is only a 1.5 hour ride from Tokyo by train or car. Alternatively, take a 20 minute bus ride from Odawara Station, on the JR Line/Odakyu Line. Located in Wakayama Prefecture, Shirahama hot springs offer visitors a touch of history and picturesque ocean views. They hold a significant place in Japan’s history, with ancient history books speaking of how a number of notable emperors enjoyed soaking in Shirahama’s hot springs. Shirahama is also home to what is said to be one of Japan’s oldest hot springs, Saki-no yu. Other must-visit hot springs in the area include the all-in-one Shirahama Onsen Park, and the highly-rated Kaishu ryokan. There are also many open-air baths along the beach, such as Shirasuna hot spring, which allow you to bathe in your swimsuit while taking in a view of the coastline. How to get there: Take the JR Tokaido Shinkansen to Shin-Osaka Station, and transfer to the JR Limited Express Kuroshiro to go to Shirahama station. The trip in total will take around 5 hours. Or you can take an hour and 15 minutes plane from Haneda Airport to Nanki Shirahama Airport. If you’re looking for a hot spring getaway only a short trip from Tokyo, Atami, Shizuoka Prefecture, is your answer. Atami’s hot springs are mainly chloride springs, which offer many healing properties such as easing nerve, muscle, and joint pain, and warming up the body. Similarly to Shirahama, Atami’s hot springs have a rich history of important figures visiting, including the first Edo era shogun, whose obsession with them encouraged many feudal lords to make the trip over to also experience them first-hand. One Atami hot spring you will not want to miss out on is Izusan Onsen, which is considered one of Japan’s three great hot springs. 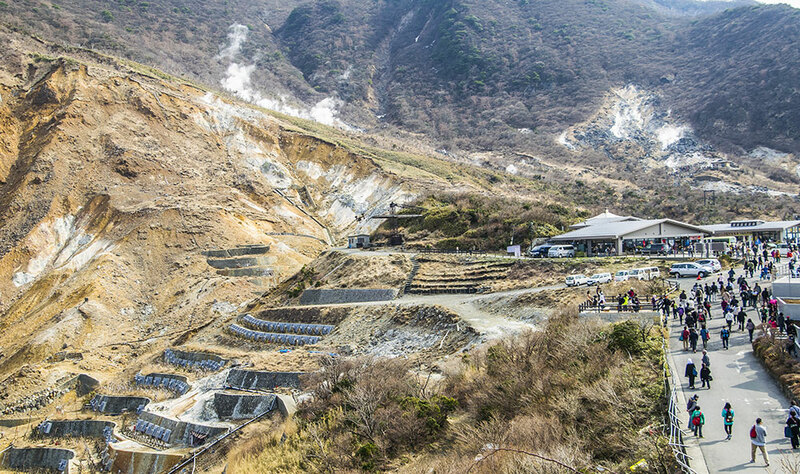 If you’re after a hot spring rich in healing properties, head to Izu-Taga Onsen. While those after variety should visit Ryori Ryokan Nagisa-kan, which has eight different kinds of baths. How to get there: Take the hour-long Tokaido Shinkansen from Tokyo, JR Odoriko or Super Odoriko limited express train from Tokyo Station or Shinjuku Station. Considering a Trip to the Japanese Hot Springs? Use Tripfuser to design your ultimate experience, and receive hand-crafted trips built by local experts. Spring (March to May): Spring is the season of cherry blossoms in Japan. So if the sound of being surrounded by cherry blossom trees as you enjoy your hot spring experience sounds like an ideal way to spend your holiday, make sure to book your trip from March to May. Summer (June to August): Although dipping into a pool of steaming hot water may not seem like the most relaxing thing to do in the summertime, it’s surprisingly refreshing. After soaking in steaming hot spring water, you’ll feel much cooler after you make your way out. As summer sees hot spring visitors decline, it’s the perfect time to visit for those who don’t like crowds. Autumn (September to November): Autumn in Japan is famed for the sheer beauty of its foliage. Think of a landscape which houses a palette of bright reds, oranges, yellows, and greens. Schedule your hot spring trip in autumn, and you’ll be able to take advantage of this most breathtaking sight. Winter (December to February): When temperatures drop, there’s nothing better than warming up with a dip in a hot spring. Winter is one of the most popular time to indulge in hot springs, so be prepared to face crowds during the colder months at more frequented hot springs. As you may have noticed in your travels around Japan, almost everything is set out in a highly organized and thoughtful way. Fortunately, many hot springs are no different – and will provide all of the essential items you need. This is particularly the case if you’re staying in a ryokan with a hot spring, or go to a more upper-end hot spring. That being said, some hot springs will not provide any items for free, so it’s best to do a quick check online to see if there’s any information about what is and isn’t provided at your particular hot spring. Toiletries such as shampoo, conditioner, and body wash. If you forget to pack a towel or toiletries and your hot spring doesn’t provide them for free, you’ll usually be able to buy them for a small fee. Swimsuits aren’t allowed: Although there are indeed Japanese hot springs which allow bathing suits, the majority of public hotspring will require you to bathe naked. If you’re shy, consider staying overnight in a ryokan with a private bath, or rent out private hot spring room by the hour. Wash before you go in: Before entering the water, you must thoroughly wash yourself. There will be a designated washing area, usually with small stools for you to sit on as you clean yourself. Use a small towel as you walk around: You’ll see that locals carry around a small towel for the sake of modesty as they walk around – and you should make sure to follow suit. Don’t let your towel touch the water: When you’re soaking in the hot spring, rest your towel on your head or the side of the bath. Don’t rinse your towel in the water or let it touch it as this is considered very rude. Don’t treat hot springs like a swimming pool: Jumping in, splashing, swimming, or other boisterous behavior is strictly prohibited in hot springs. Hot springs are for relaxing, so be mindful not to disturb the peace. An important note if you have a tattoo/s: Some hot springs have strict rules against letting in people with tattoos. This conservative approach is based on the historical link in Japan between tattoos and organised crime. Even if you’re a foreigner with traditional tattoos from your country or a small tattoo, be prepared to be turned away by some places. Don’t be disheartened though, there are many tattoo-friendly hot springs throughout the country. Make sure to check online beforehand to avoid disappointment. 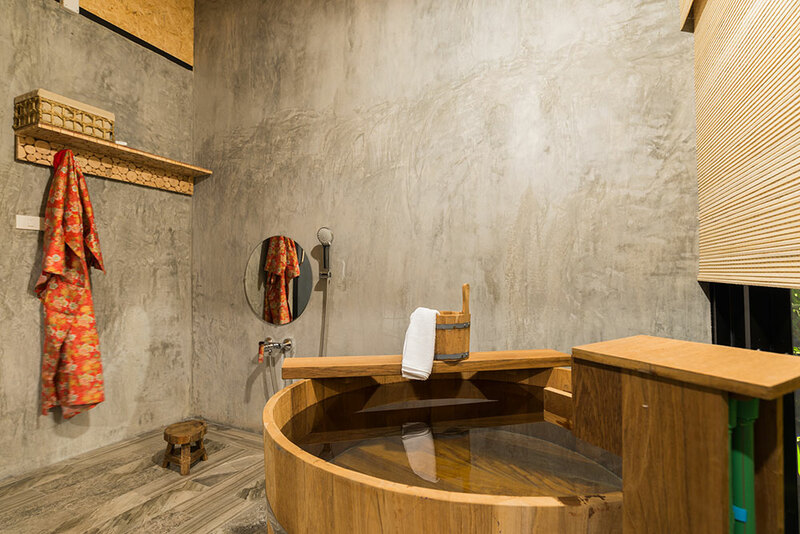 Across two days and one night, you’ll be able to explore the wonder of Yamanashi prefecture, one of the best places for onsen in Japan due to its “natural mineral rich waters that flow from Mt. Fuji, Minami Alps, and the Nagano Alps.” The tour is customized to suit your needs, and includes a professional guide service, one night private room, first day lunch and dinner, second day breakfast and lunch, and two days of hot spring entrance. 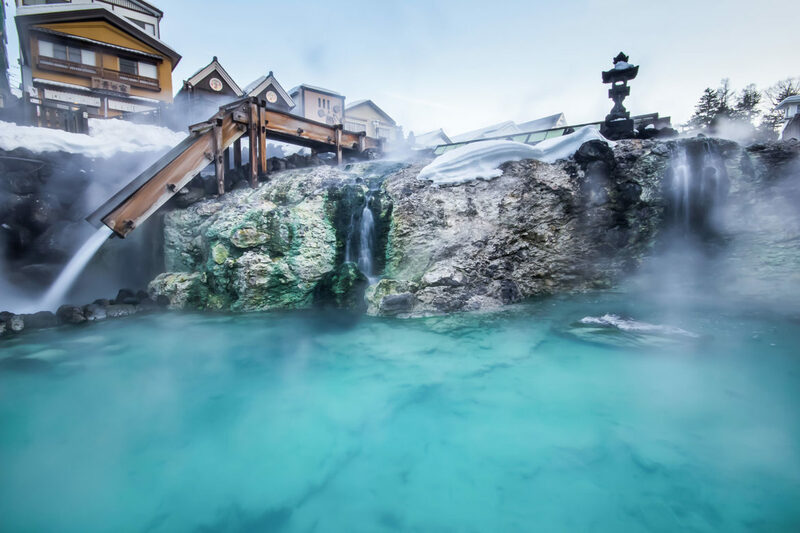 The Kyushu Onsen Tour is a five day tour of some of Kyushu’s most well-known hot springs. Kicking off and ending in the bustling city of Fukuoka, you’ll travel to two of the most notable hot spring spots in Japan – Beppu and Yufuin. The package includes 3 days JR Northern Kyushu Rail Pass (ordinary class), and all of the accommodation and food specified in the itinerary. This winter-time tour will provide you with the opportunity to partake in guided snowshoeing in Tohoku, north Honshu. You’ll walk through a winter wonderland of snow to reach a new hot spring each day. The tour price includes: a fully guided tour including local travel from tour meeting point at Tokyo Station to tour finish point in Sakata, accommodation for eight nights, eight breakfasts, six lunches, eight evening meals, snowshoe rental, baggage transfers, and entrance fees.